The world is developing in an increasingly digital way. As a result, it’s so much easier to share information. What you find below is a repository of useful stuff I’ve picked up in the last few years. Hopefully it helps someone else too. If you know of any good links to media related to anything below, then post a comment so I can check it out. 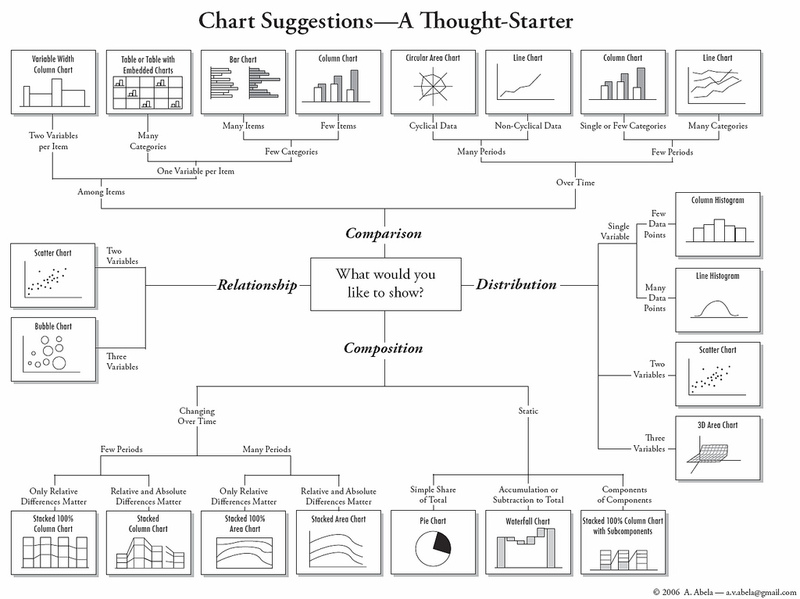 Brilliant Chart Suggestions – Thought Starter image. Groups charts by common characteristics. ‘Economical Writing‘ by Deidre McCloskey (formerly Donald!) is the most succinct, readable and well-written book on academic writing in Economics that there is! She is clever, funny, witty, and ever so skillful in the craft of writing. You can find a summary of the book here (by McCloskey herself), and earlier versions of the book released as a journal article here. (This is also quite useful as a handout). Even those who have no interest or background in Economics will find the book useful and interesting – the focus of the book is more writing than economics. STATA now has a YouTube channel with training videos. See here. (Not STATA) – Analyzing data – GraphPad – even though this is for a specific program, it is still really useful (and good as an introduction). Presentations on the state of South African education – presented at a policy-workshop on the 28 March 2011. The full report can be found here. Best OpenCourseWare materials on the web: MIT OCW – videos, course-notes, course-outlines…check it out, it’s incredible. ***As far as I am aware all of the content I’ve put on this page is not copyright protected and is all freely available on the web. Anything else I’ve put up is either my own or with permission of the author. If I have violated any copyright laws by posting an item on here, please send me an email and I’ll take it down.